It's the Big Garden Birdwatch this weekend - a really simple idea, and anyone can get involved. Simply pick an hour at any time on Saturday or Sunday, find yourself a nice comfy chair next to a window, and note down all the birds you see. Then you log your sightings on a website where they will form part of a national survey. Lots more details here. I'm planning to do my 'watch' from the Cottontails office and will let you know what I see next week. 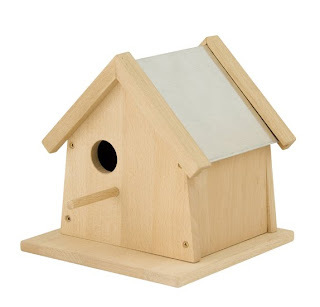 This is the lovely wooden nest box from Moulin Roty. I really must pilfer one from stock and put one of these up this year. Am quite excited as this might be featuring in an interiors magazine in a couple of months, fingers crossed. 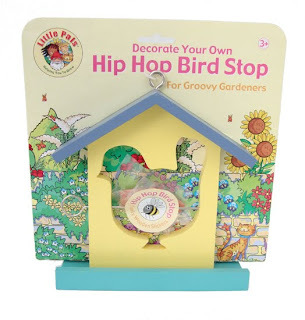 This is a sweet little bird feeder - I've already got (a slightly damaged) one put aside to put up in the garden but haven't got around to it yet. 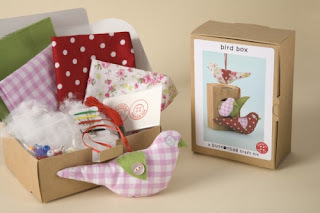 And this is really lovely - a little 'sew your own' kit which contains everything needed to make three little fabric birds. And the box turns into a bird house! 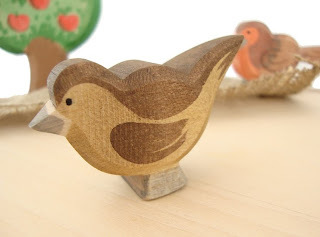 Oh, and the picture at the top, that's one of the gorgeous hand made, hand painted Ostheimer birds - a little sparrow. You can see him here. We have a lovely Lesser Spotted Woodpecker that visits every day to pinch the peanuts from the little birds, he hops up the tree and gets stuck in....then vanishes the minute I get my camera out!! I almost had him yesterday and was just about to press the shutter and the battery ran out...drat and double drat!! I have a Lesser Spotted Woodpecker outside the office occasionally - it would be wonderful if she would put in an appearance for the big count tomorrow! Maybe I could make a bird today. You would love seeing my little granddaughters with their mice. They drag them around my house AND their own house. We are so in love with them. Hello from the Czech Republic. Just stumbled upon your blog. I love the sweet toys. 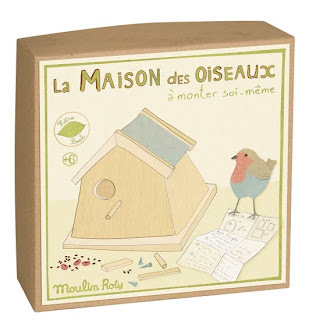 I was pleased too to see you post about Moulin Roty, their dolls and toys are wonderful.